It is our pursuit of DXCC (and other awards as well) that drives us to deal with the trials and tribulations as well as the costs of QSLing. It is my opinion that making the DX contacts is a whole heck lot easier than confirming them. I may spend almost as much time resolving QSL routes as I do looking for new DX to work. Click here for the ARRL DXCC program information page. When we compare our DXCC standings with our buddies in the hobby, it should NOT be the worked counts compared, but rather the confirmed counts, that success is much more impressive to achieve. It is very true that almost anyone can work DXCC in a weekend or less, but NO one can confirm DXCC in any resonable amount of time via the mails. Don't bother to mention eQSL, for until the ARRL adopts (their own to be sure) a method for electronic QSLing that will be accepted for DXCC only printed confirmations are any good. By the way, for anyone that is interested, my worst case QSL turn around time through the QSL bureau system is just about 10 years. That card I send out direct and had it returned via the Bureau. I am not complaining mind you, as it was for a real hard to get country and I got the card, it is just a fact of the the game. For those that are not aware just yet, there is no such thing as a guaranteed QSL card returned for your request (or should I say QSL card application) no matter how you send your card. Also, just because you send your card direct or to a manager does not mean that you will get it back that way, if you did not send enough postage it may come back via the bureau if you are lucky. QSL cards and envelopes are the easily identified costs. When you print your card make sure you have all the NEEDED info on the card and make enough cards to last for a reasonable amount of QSLing to get a good price point break. Buy your envelopes with the mind set that they may sit around for a while, so shrink wrapped in 25 or 50 count packages that can remain sealed is a good idea if they are not the peal off self adhesive type. Also get decent quality security envelopes as cheap ones will not make it past the the automated sorting equipment and pilfering that goes on. For overseas QSLing Air Mail sercurity envelopes are the best way to go, but even plain white security envelopes and a good RED ink rubber air mail stamp works too and is cheaper if you so desire. Remember that you are paying for the cost of postage both ways for your QSL card request, no matter what method you use to send your request, direct of via the bureau. Within your own country the QSL game is the easiest. Just send an SASE (Self Addressed Stamped Envelope) when ever your are requesting (making an application for) a QSL card. Also, a contact in your own country or QSL manger in your own country is the cheapest and simplist way to go. Luckily for those of us in the U.S., most QSL Managers are here as our amatuer population warrants this fact, it is to the DX stations benefit as well, some DX stations may have more than one manager, one in the U.S. and elsewhere. However, overseas QSLing is a bit more difficult. 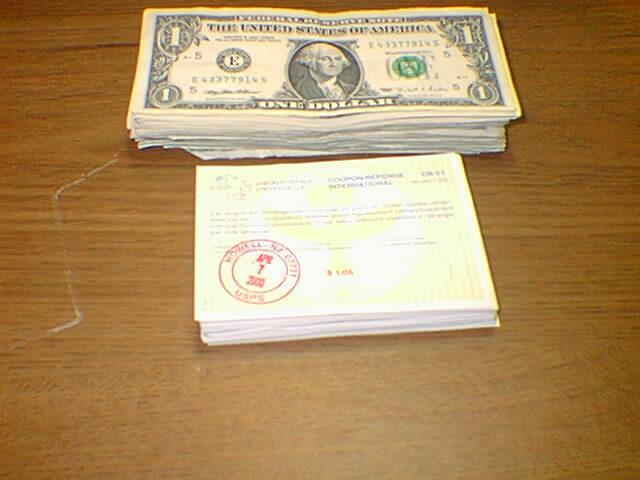 The world standards in the QSLing game for return postage is the IRC (Internation Reply Coupon) and the Green Stamp (a $ingle U.S. One dollar bill). The trick is to figure out when it is best to use which and how many to send of eash for the overseas QSL be applied. Don't be surpirsed when you make your first contact in a rare country that can only be confirmed via direct QSL using International Registered Mail ! and the amount of return postage requested. The IRC, International Reply Coupon is good for and I quote; "This coupon is exchangable for one or more postage stamps representing the minimum postage for a priority item or an unregistered letter sent by air to a foreign country". The cost of postage is constantly go up worldwide. Furthermore, the weight of a piece of air mail for the minimum unit of air mail postage around the world is NOT the same. Recently here in the U.S. rates changed, the previous Air Mail 1/2 an ounce at $0.60 on January 7th, 2001 changed to 1 ounce at $0.80 so even here in the U.S. we have a major change. It will cost $0.20 more to send a 1/2 ounce or less of air mail (the average with of a QSL package of 3 or less cards) but will cost $0.20 less to mail up to an ounce. In some coutries to mail the equivilent of a 1/2 ounce may mean purchasing 2 or 3 or more units of postage, so you need to send that number of IRC's. There is NOT an all encompassing list of how many IRC's to send to each country of the world, I am creating my own, but it far from being all encompassing. Also, in a lot of "out of the way" places IRC's are NOT wanted because of two reasons, they do not put profit in the DX stations pocket or they are not easily or at all exchangable for postage. So do your research via the QSL route lists etc. before sending. At present the International Postal Union has 189 participating countries, although a country is listed, it does not mean that the country honors an IRC for a single unit of first class postage. A rule of thumb that many experienced at QSLing use is two IRC's or two Green Stamps when QSLing to another continent, otherwise one IRC or one Green Stamp unless otherwise specified by the DX stations. It is (at the moment) cheaper to send U.S. dollars than an equal number of IRC's, however that changes in 2001. Furthermore it is illegal in many countries for citizens to possess foreign currency (there is NOT an all enclusive list that I have been able to find, I am constructing one however). I say that you should sit on all contacts for a while before you send them off for a confirmation. A few months is always a good idea as you may work the station again on other bands (especially DX Expedition and BIG TIME DX stations like 5A1A) and it costs less to QSL for multiple contacts if you do it all at once. At any rate, tt also takes time for the logs to be transferred to DX Managers and posted by DX Expeditions. Believe me it pays to check those on-line logs via the internet to see if you are in there correctly. If NOT, you want to drop a note in with the QSL asking them to check the BUSTED call. If you did NOT get the QSL route from the contact during the exchange or it is not a well advertised DX Expedition, then do plenty of QSL Route research before you mail. Again a subscription to a good DX Newsletter is a good idea. Always enclose an SAE (Self Addressed Envelope) when ever you want a return card. This even includes contacts within your own country. Always use privacy envelopes. For overseas mail always use privacy air mail envelopes. When mailing to a station in the same country then add the current amount of postage affixed to the SAE (SASE at that point). For overseas QSLing either affix the proper postage for that country (not my choice) or supply enough funds to cover the return postage in the form of an IRC (International Response Coupon) or Green Stamp (U.S. Dollar Bill). For DX contacts the international standard size of approximately 145mm by 90mm is the minimum. Here in the U.S. I currently purchase 4 1/2 by 6 1/4 return e-mail envelopes that fit into 4 3/4 by 6 1/2 out going mail envelopes without folding. Always place the sealing fold of the return envelope into the mailing envelope first. Use a big RED ink title stamp with the wording "AIR MAIL" on the front and back of all Air Mail envelopes. I prefer the Xstamp series personally. Address the envelope both properly, indicating the target country and legible. Also, for DX contacts I prefer to hand write the address to the envelope. The use of a mailing label as well as placing anything that denotes amateur radio on the envelope is an invitation for pilfering. It may also add just enough weight to put you into the next postage rate depending on the number or cards you are sending. Fold your self-addressed envelope over the IRC/Dollars with the address innermost and the open end up when inserted into the envelope. Use a fairly interesting QSL cards with your QSO information on the same side as the callsign and write a few meaningful remarks on the card. DO NOT include the callsign or any amteuer radio related wording in the addressing of envelopes. DO NOT make reference to amateur radio on the envelope unless it is part of the address, such as club related and then only to a well known postage system country. DO NOT use attractive special issue postage stamps, as these can be removed and used in exchange for goods in some countries, with your QSL lost. DO NOT keep sending dollar bills or IRC's if you do not get a reply. Why should anyone reply if he keeps receiving your money! ? DO NOT alter errors on cards it looks untidy and some award authorities may not accept them. Make a fresh card out, the DX station may need your card also. For information on my commercial amateur radio products please click here to send e-mail or visit the main website. This site is and will always be under construction, since there is always room for improvement. Entire contents Copyright © 1999-2001 by Stephen B. Hajducek, N2CKH. All Rights Reserved Worldwide.